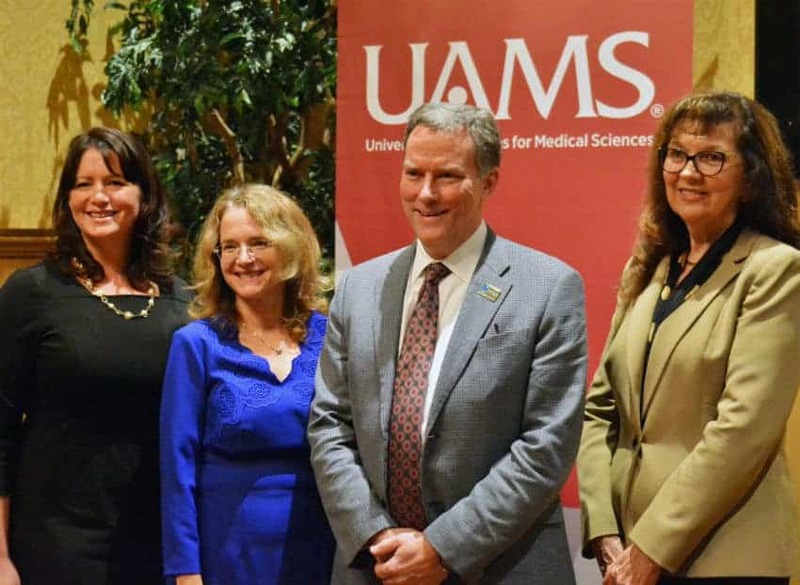 (From left) Pearl McElfish, Ph.D., MBA, vice chancellor for the UAMS Northwest Regional Campus; Mary Ann Scott, Ph.D.; Frederick “Rick” Barr, M.D., MBA; and Gilda Underwood, Schmieding Foundation president; at a reception held last year welcoming Barr to UAMS. Aug. 7, 2018 | Aug. 7, 2018 | The Schmieding Developmental Center in Lowell, a pediatric program of the University of Arkansas for Medical Sciences (UAMS), recently received a three-year, $651,000 grant from the Schmieding Foundation to expand its programs and support operations. The center, which provides state-of-the-art developmental assessment and care for children birth through 18, is part of the UAMS College of Medicine Department of Pediatrics. The Schmieding Foundation, an independent foundation in Springdale, has long supported the center, beginning with the initial endowment to create the center in 1993. The center’s goal is to help children overcome developmental diagnoses and have success in school, daily life and in their family and peer relationships. Assessments address conditions including epilepsy, autism, anxiety disorders, ADHD, concussions, miscellaneous neurological conditions and pediatric cancer. The center sees about 350 newly diagnosed patients each year. Center staff include a psychiatrist, two neuropsychologists, psychologist, psychological examiner, social worker and speech pathologist. “We deeply appreciate the generosity of the Schmieding Foundation and their commitment to improving the health of children in Arkansas with developmental disabilities,” said Frederick “Rick” E. Barr, M.D., MBA, chair of the Department of Pediatrics and associate dean for child health in the UAMS College of Medicine.